SDHQ Shortened their R&D process greatly by replacing costly machined welding fixtures with Markforged 3D printed ones. 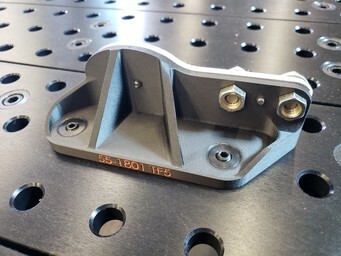 Markforged enabled SDHQ Off-Road to expedite their research and design (R&D) process for developing custom off-roading truck racks that secure critical equipment. Shop Foreman Kevin Ketchner used to weld steel plates into custom fixtures in order to hold end products together during welding. This took significant time and manual labor. Despite his years of experience and expertise, the process was inherently riddled with sources of diminished quality — imperfect bending, crooked tacking, corrosion, unrepeatability, and human error. Kevin quickly realized that “the process of making the printed fixtures was a lot faster and easier”. His Mark Two eliminated the problems that the welded fixtures presented. Fixtures no longer need to be crafted by hand, and can actually be designed to more effectively secure the parts that need to be welded. Furthermore, Onyx resists corrosion and he can easily reprint fixtures if they break.